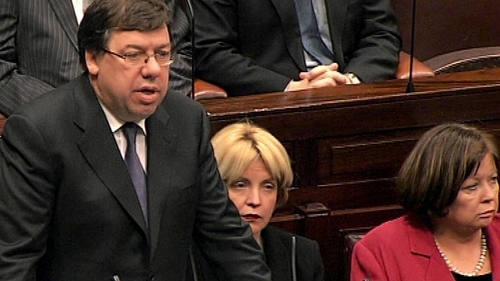 Taoiseach Brian Cowen has rejected Fine Gael's accusations that he is engaged in an ongoing attempt to cling on to power. Mr Cowen also ruled out bringing forward the date of the Budget. He said that clinging on to power was not his motivation and said it is a priority that the Budget is passed. He was responding to Fine Gael leader Enda Kenny. Mr Kenny also said the authority and trust of the Government had evaporated over the last week. Mr Kenny said the budgetary process and a slimmed down Finance Bill could be completed by Christmas. Mr Cowen said the timeline for the budgetary process had been agreed with EU Commissioner Olli Rehn and it was important to proceed with that to bring certainty. The Fine Gael leader also said he will accept the invitation to meet with IMF, ECB, and EU Commission officials. The Taoiseach said he thinks the Budgetary process will be completed by February. Mr Cowen said he believes there will be support for the Budget and said it is a matter of personal responsibility whether people vote for it. Labour leader Eamon Gilmore said he was also in favour of bringing the date of the Budget forward. He said last year the Finance Bill, which gives affect to Budget changes, took three months to pass. Mr Cowen said the Government had to wait to get the November tax returns. Both the main Opposition leaders remarked on the absence of the Green Party from the Dáil chamber. Mr Kenny said: 'Yesterday we saw the spectacle of your absent friends withdraw their support on the basis that they had been betrayed and there was not proper communication within the Cabinet'. While Mr Gilmore said: 'One of the parties in Government have semi-detached themselves now from Government'. Later Mr Gilmore asked asked the Taoiseach if the Green Party ministers had sumbitted their resignations yet, or would the Taoiseach be exercising his prerogative to request their resignations. Referring to comments made by Commissioner Rehn and the IMF, Tánaiste Mary Coughlan earlier said it was an absolute pre-requisite for the stability of the country that the Budget and the four-year plan were passed. She said that was the clear reason why we were not having an election now. Ms Coughlan said an election would pose a distraction. Minister for Tourism, Culture and Sport Mary Hanafin said she was not convinced that the Green Party has the best interests of the stability of the country at heart. Ms Hanafin said she was annoyed by the manner in which the party had called for an election yesterday, something she said was not expected. But the minister said she and Fianna Fáil would 'work with them' in order to pass the Budget and the four-year economic plan. She said she was not reluctant to work with the Greens and would work with anyone, including the Opposition. Minister Hanafin said she was not uncomfortable during yesterday's news conference with the Taoiseach, when he announced he would dissolve the Dáil following the budgetary process. Asked if she thought it may be the time for an election now, the minister said if there was an immediate election it would not be possible to pass a Budget on time and she said she and her Fianna Fáil Cabinet colleagues had discussed all the options open to them. Green Party Senator Dan Boyle has described what the Greens did to the Government 'as a kind of renegotiation of the Programme for Government'. He said they had now put a time limit on what had been agreed to. And he said the Irish banking crisis was as much an international problem, as an Irish one. Separately, Fine Gael TD for Galway East Paul Connaughton has confirmed that he will not contest the next election. The 66-year-old former junior minister for agriculture has been a TD since 1981. He is currently the party's deputy spokesman on foreign affairs with special responsibility for the Irish diaspora.